Through Healthy Emory Connect, Emory’s wellness app, employees can set health goals for sleep and a variety of other focus areas, with the potential to earn up to $300 in medical plan incentives. “Learning that less sleep unnecessarily ages us caused me to put my thinking cap on — so I turned to Healthy Emory,” says Joy Hartsfield, a researcher interviewer in cardiology at the Emory University School of Medicine. During the recent “Sleep Better! Feel Better!” campaign, which promoted sleep health resources and tools on Healthy Emory Connect, Hartsfield decided to focus more on her sleep after having a milestone birthday – she turned 60. She wanted to take small steps to increase the quality and the quantity of her sleep. Healthy Emory Connect is an online application accessible via desktop and through a free mobile app that is downloadable from the Apple App Store and Google Play for Android devices. It allows users to set individual health goals across a variety of focus areas, such as sleep, activity, nutrition, stress management or emotional health, with the potential to earn up to $300 in Emory medical plan incentives. 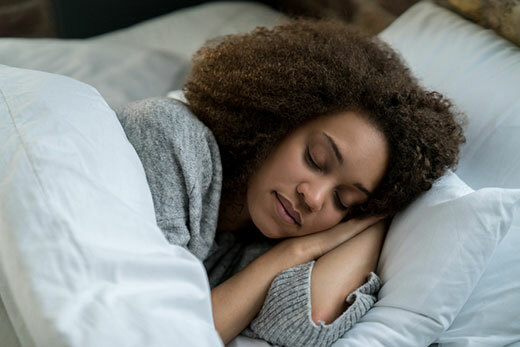 According to the National Institutes of Health, getting enough quality sleep can protect you physically and mentally, keep you safe, and improve your quality of life. Yet, many of us find it difficult to achieve the minimum seven hours that experts recommend. Hartsfield knew the importance of sleep but had trouble due to the constant noise of people coming in and out of her building at all hours of the night. She decided to make a plan of action to improve her sleep. “I needed to stop what I was doing and go to bed,” she admitted. She began setting a “sleep hygiene” alarm on her cell phone which prompted her to get ready for bed. With this alarm, she began training her body to go to bed earlier and earlier, so she could get more hours of sleep before the nightly noise began. To dampen the outside noise, she used a white noise machine in her bedroom. Throughout the day, Hartsfield tracked her progress using the “Healthy Habits” on Healthy Emory Connect. This allowed her to answer a simple yes-or-no question on whether she maintained a specific habit for the day. She also began increasing her physical activity by taking longer walks and increasing the time she spent practicing martial arts. As she continued, Hartsfield noticed it was easier to go back to sleep if awakened by noise. After a while, her skin, hair and nails began looking better, her energy increased and she was sleeping longer. In addition, she started earning points towards her Emory medical plan incentive through the use of Healthy Emory Connect. “I take a standing break or a walking break from work to log in to Healthy Emory Connect. There I see in one easy view the points I’ve earned toward incentives for my health savings account,” Hartsfield says. Now she encourages others to add more sleep into their regimen. “Whether it is 15 minutes of extra rest or eating properly, simple steps have armed me in the fight to stay fit no matter what my age,” she explains. To learn more, go to: Sleep Better! Feel Better!.